PROCEEDINGS OF DIRECTOR, STATE COUNCIL OF EDUCATIONAL RESEARCH AND TRAINING, TELANGANA STATE, HYDERABAD. Sub: SCERT, TS, Hyd. - ET- Dept. 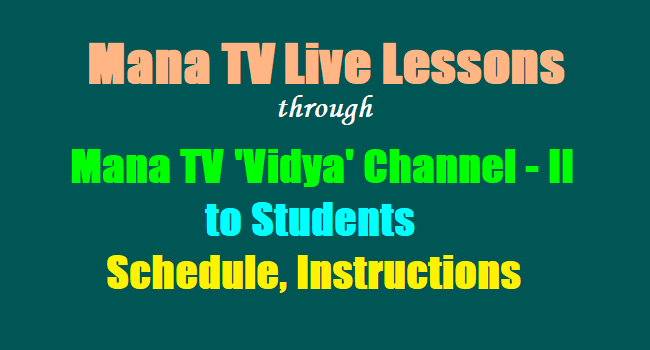 - Mana TV live Lessons - live telecast of lessons for students of class VIII to X from 01-07-2017 onwards through Mana TV 'Vidya' Channel-II - Schedule furnished - Certain instructions Issued - Reg. The District Educational Officers in the State are hereby informed that transmission of interactive (live) lessons for the students of class VIII to X is commencing from 01.07.2017, through Mana TV 'Vidya' Channel-II. live lessons will be transmitted on every working day from 11.45 AM to 12.30 PM. Day-wise and subject-wise transmission of Mana TV live lessons for the students of class VIII to X is given below. There are toll free numbers 18004254038/18004254039 (Scroll on TV Screen) through which students and teachers can interact with the presenter and get clarification on the concepts during presentation of lesson. However, there will be interactive session at the end of every lesson. Transmission of live lessons will be inaugurated by Director, SCERT with inaugural address at Mana TV studios at 10. 00 AM. Therefore, the DEOs are requested to bestow their personal attention and issue necessary instructions to HMs to incorporate in their time table to view the lessons and furnish feedback report on every week i.e., on every Saturday. Further, the DEOs are requested to relieve the live presenters one day before on their presentation day shown in the schedule. Copy of schedule is enclosed.